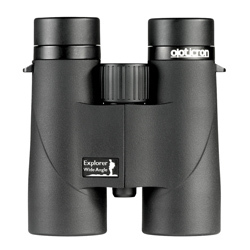 New to 2012, the Explorer WA are smaller, lighter and offer a wider field of view compared to their predecessors. For around the £200 mark, the Explorer WA range offers you the opportunity to own a quality pair of binoculars without the high price tag. I have used both the 8 and 10x42 models for the review and will make specific comments on each where applicable but the score will apply to both models. 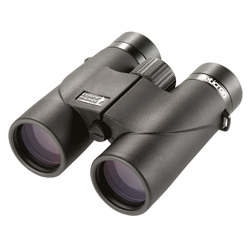 The obviously impressive feature of these binoculars is their wide angle field of view, 7.5° on the 8x42s and 6.5° on the 10x42s. For both magnifications these figures are at the top end of the scale with other binoculars in their class offering significantly lower angles. I found this to be incredibly useful in the field on both the 8 and 10x42s as it enabled a good view of an entire scene, for example, groups of birds could be viewed comfortably without having to move the binoculars about all the time. The levels of edge distortion were a minimum too, hardly noticeable, in fact. The lower magnification models benefit from allowing more light to enter the objective lens, hence producing a slightly brighter image than the 10x42s. That being said, I was more than impressed by the image produced by the 10s and was very comfortable using them, with the slightly higher magnification being advantageous for distant birds. Both models produced a very sharp, clear picture that represents good colour rendition and contrast. The stated minimum focus is 2m and 2.5m for the 8x42 and 10x42's respectively. I found I could get slightly closer with both models, each of which would be ample close enough for insect watching. The Explorer WA body is made from a lightweight magnesium alloy, the 8x42s weighing in at a tad over 650g and the 10x42s a bit under. Typically of Opticron (their ethos is in fact "smaller, lighter, sharper") this is nice and light for a full size roof prism binocular, but they still feel like a well built pair of binoculars that hold balanced in the hand. The focus wheel is smooth and grips well, though was a tad slow for me. The retractable eye cups locked nicely in 3 places; right down for spectacle wearers, mid way up and full way up for maximum eye relief. On the whole the Explorers were comfortable to use, the soft touch rubber covering giving the binoculars a pleasingly reliable grip. Physically the 8s and 10s are very similar and the design fitted my hand nicely, with the index finger comfortable on the focus wheel with my 3 other fingers nicely fitted over the bridge. 2016: The Explorer has been improved again, now with ED glass. 2018: Opticron have now improved the light transmission with Oasis-C+ coatings.